Join the Toro family this season with a brand new Power Max 826 OXE snow blower. This snow blower features a 26" clearing width and up to 40’ of throwing distance which is sure to help you clear your driveway quickly. This blower is built for durability, with hardened gearbox gears and a one-piece frame,this blower is sure to stand up to the toughest conditions. Automatic steering makes the blower easy to use and makes for a very smooth snow blowing experience. Get your Power Max 826 OXE snowblowers now to be sure you have a durable and easy to use blower for the next snow storm! Toro Premium Engine: Proven power and performance in the tough winter conditions is offered by the Toro Premium engine that provides 252cc of power. Clearing Width: Quickly clear snow with a 26 inch clearing width. Electric Start: Electric start is featured with recoil back up for hassle free easy starting. Automatic Steering: Allows for a smooth, tight turning radius without straining yourself. Headlight: An extra bright flood light is installed for operation during low light hours of the day. Quick Stick Chute Control: One simple control quickly changes the direction of the chute and the chute deflection. Power Max Anti-Clogging System: Impeller speed is maximized by regulating snow intake to eliminate clogging. This allows the snow blower to handle more snow and get your job done faster. Sub Zero Material: To prevent rusting and snow or ice from sticking the impeller cover, deflector, and discharge chute are made out of high density sub zero material. This material can stay flexible down to -104° F.
One Piece Frame: Strength is offered by the solid steel one piece frame. Deep Lug Tires: Offering the best traction in slippery conditions with squared off deep lugged tires. Control Handles: Keep one hand free to adjust the chute while using the one-hand interlock system controls. Ideal For: clearing 6-14” of snow on an 8+ car driveway. 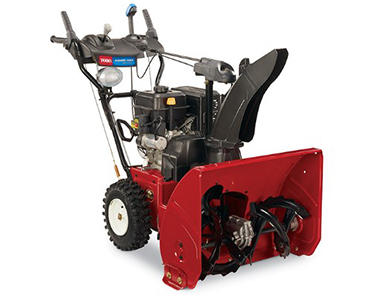 Description: Fits two-stage snow blowers up to 31 inches wide. Fast slip-on protection. Protects against rain and snow, sun damage, dust, tree sap and birds. Elastic shock cord in bottom hem for a quick, custom-like fit. Handy integrated stuff sack. Heavy-duty fabric won't shrink or stretch. Fabric is coated for maximum water resistance. Description: SAVE TIME ON SNOW AND ICE REMOVAL With the MeltBuddy mounted to your snow thrower you can clear snow and spread ice melt in a single pass. The easy-to-use hand trigger and large capacity hopper allow you to drop ice-melt granules only where needed. Description: Designed to provide a protective layer between your snow blower and flooring surface during storage. Durable rubber mat is made out of textured recycled materials and has a raised edge to keep melting snow contained, preventing a hazardous slippery floor. Floor surface is protected from gas, oil, rust spots and scratches. Mat is 36" X 36", making it suitable for most snow blower models. i'll need some snow to review, but not asking for a lot! Ask us about the Toro Power Max 826 OXE 26 inch 252cc Two Stage Snow Blower. Please no repair questions. Your Q&A may be posted to SnowblowersAtJacks.com to help other shoppers, like you, with their purchasing decisions. Thank you.